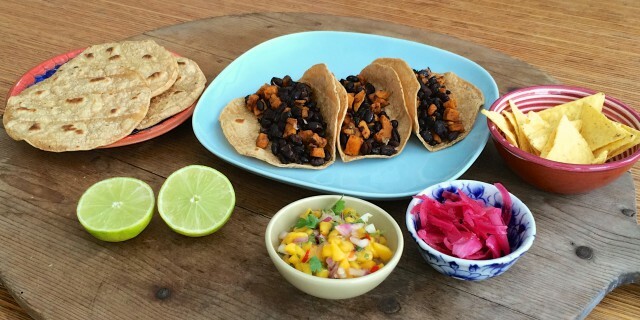 These California-style Sweet Potato Black Bean Tacos are easy to make and utterly delicious. During my trip to California I fell in love with Cal-Mex, the Californian interpretation of Mexican food. On menus you see different styles and names, including Tex-Mex, Fresh-Mex or Baja Style Mexican Food. It’s healthy, fresh and vibrant food that tastes simply spectacular. It’s not oily or greasy but has a refreshing, clean taste instead. Local, fresh ingredients are used so you get a taste of the season. You see lots of fresh colourful veggies, pickles, fresh herbs, black beans, avocado, lime and crispy tacos. The food in California really blew my mind. I still salivate when I remember the food we had during our road trip from LA to San Fransisco. We enjoyed crispy tacos with the freshest fillings in beach cafes cruising the PCH from LA to San Fransisco, such as at The Reel Inn in Malibu. We had the best tacos ever in this hip and trendy place in San Fransisco, called Mamacita. Tacos with fillings like Dinosaur kale, baby beets and red cabbage. We also had a great time at an ‘old school’ Mexican taqueria at back of the airport in Oxnard, almost hidden from sight, completely off the charts. I loved the ‘aqua frescas’, water infused with fresh fruit like watermelon, and the tortillas were the real deal here, a bit on the heavy side but delicious. I sometimes really miss places that serve this kind of food here at home. So far, I haven’t found a place here that comes close to that kind of food, so I make it at home. Enjoy these crispy Sweet Potato Black Bean Tacos. Serve them with pickles and fresh cilantro, Mango Pico de Gallo or Fresh Tomato Salsa or homemade guacamole. Tomato Salsa Fresca , Mango Pica de Gallo, Pickled Red Onions or homemade guacamole. Add the sweet potato cubes to a large non-stick baking tray. Add olive oil, garlic and the crushed chili. Mix well. Add a pinch of sea salt. Roast for 20-30 minutes until soft and nicely browned. Remove the sweet potatoes from the oven and add the cooked black beans. Mix thoroughly and season with black pepper and sea salt. Add one soft corn flour taco to a hot skillet. Cook the taco on the first side until it begins to bubble and pop. Then flip to the other side. Cook until lightly charred. Fill the tacos with the sweet potato and black bean mixture. Top with Pickled Red Onions and freshly chopped cilantro. Or serve with Tomato Salsa Fresca, Mango Pica de Gallo or homemade guacamole.